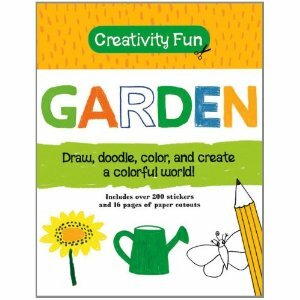 Creativity Fun: Garden is a brightly colored doodle book which focuses on the theme of gardening. (Yes. I am pointing out the obvious. Sometimes that's what I do best.) 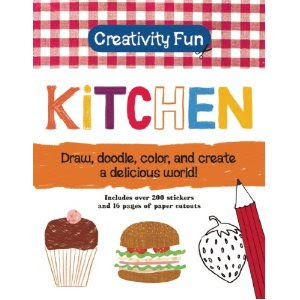 This recently released activity book encourages imaginative drawing, decorating, doodling and writing. It is part doodle book and part sticker book, as it has over 200 stickers to use inside. The user of Creativity Fun: Garden is encouraged to make garden bugs out of colorful splotches, to draw leaves on trees, to complete rainbows and to beautify butterflies. It's a great little activity book with thick and sturdy pages which can handle crayons or markers. There are some pages with patterns and figures to cut out, but the majority of book merely requires crayons. Inside you'll find 72 pages worth of coloring activities, making this a great book for a road trip or a quiet afternoon on the back patio. It's cute and bright and, I think, quite entertaining. It's a nice little way to cause children to pay attention to the great outdoors, even during a time when they might be trapped inside a bit. There are a few other books in the Creativity Fun series, should this particular title not be of extreme interest to your young artist. 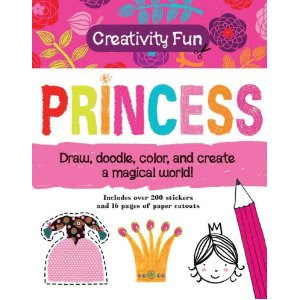 Other titles include: Creativity Fun: Kitchen and Creativity Fun: Princess . We were sent a copy of the Garden and Princess books above by Silver Dolphin books, in exchange for sharing our honest opinion. Our honest opinion is: cute and fun books to have on hand when you need a distracting and quiet activity available to occupy children for a bit! Thanks, Silver Dolphin, for shooting these our way. I'll have to look for those -- my kiddos love doodling books!